If you recently purchased a bus and are hoping to convert the vehicle permanently into a home, tailgate location, or RV, you likely want to paint the bus accordingly. Getting a bus professionally painted is very expensive so we have provided you with some tips on how you can paint your bus to prepare it for a conversion. 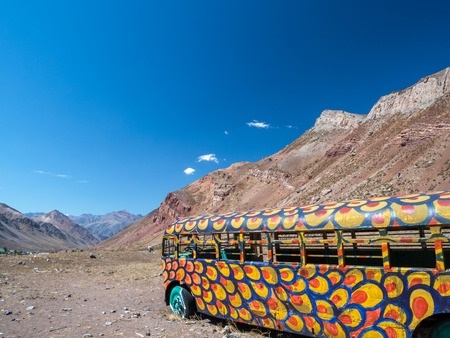 One of the biggest things to consider before painting your bus is the weather forecast. Don’t forget to consider changes in temperature and humidity and watch out for precipitation, all of which can affect your paint job. Painting such a large surface requires the proper painting tools to get the job done. Use a paint roller for the larger surfaces of the bus and a smaller brush for detailing. Grab plenty of painter’s tape and painter’s plastic to cover up bumpers and tires. Choose a paint that will stick well to the vehicle without breaking the bank; consider using paint with a hardening agent to get it as close to automotive paint as possible. Taking on the task of painting an entire bus is not easy. Preparing to paint should be a priority and you should take your time getting things ready before you start painting. Don’t forget to clean and scrub down the bus with soap and water before painting. Be sure to sand down the bus’s exterior to make sure the new paint sticks. Once you are ready to start painting, take your time and cover the bus in full using several coats of paint. You can find a huge selection of new and used buses for sale from Las Vegas Bus Sales; shop our inventory today here.